The Philadelphia 76ers made a statement Sunday in a potential playoff preview. Giannis Antetokounmpo scored a career-high 52 points, but Joel Embiid and the 76ers were too strong in a 130-125 win on the road against the Milwaukee Bucks. Antetokounmpo and Embiid did battle in the post and on the perimeter all day, trading drives to the bucket and showing off their 3-point range in one-on-one matchups. Embiid tallied 40 points, 15 rebounds, six assists and three steals in victory while banging in the post and stepping out to hit four 3-pointers. Antetokounmpo also filled up the box score, adding 16 rebounds, seven assists and two steals to his 52 points while knocking down three 3-pointers. Antetokounmpo shoots 24 percent from long distance and makes fewer than one 3-pointer per game, prompting Embiid to challenge him to shoot from deep. Antetokounmpo answered. 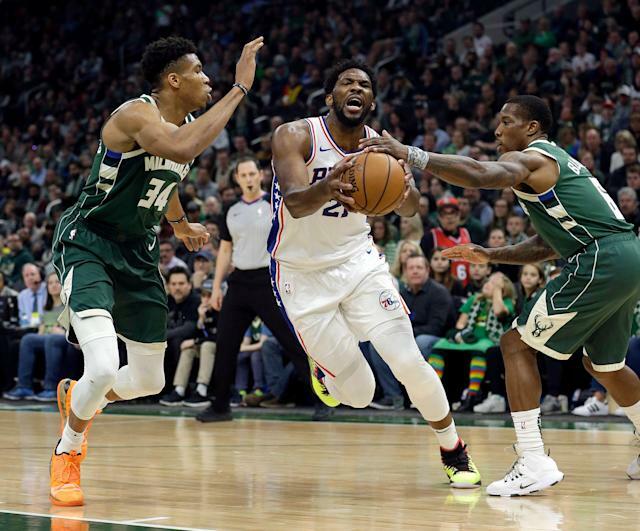 The 76ers took control early and extended their lead throughout the first half before fending off the Bucks’ second-half rally led by Antetokounmpo. Milwaukee closed the gap, but never took the lead in the second half. Ben Simmons got in on the action with Antetokounmpo in the game’s waning moments as the two traded poster dunks on each other, with Simmons getting the last laugh. And he let Antetokounmpo know it. Simmons finished with nine points, nine rebounds and nine assists as Jimmy Butler joined Embiid in dominating scoring for the 76ers, tallying 27 points, six rebounds and three assists. Tobias Harris took a back seat, scoring 12 points on seven field goal attempts while adding seven rebounds and four assists. Khris Middleton was Milwaukee’s second-leading scorer with 19 points to go with seven rebounds and six assists. The Bucks were without the sharpshooting of Malcom Brogdon, who was diagnosed Saturday with a plantar fascia tear that’s expected to keep him out 6-8 weeks, which would extend through the first round of the playoffs. Brogdon is a member of the ultra-exclusive 50-40-90 club, hitting 50.5 percent of his field goals, 42.6 percent of his 3-point attempts and 92.8 percent of his free throws. He’s a valuable weapon who will be missed, especially if his absence extends into the second round of the playoffs. The game was a matchup of Eastern Conference powers that could potentially meet in the conference semifinals or finals. The Bucks have the best record in the league and are slotted for the top seed in the playoffs, while the 76ers hold a one-game lead over the Indiana Pacers for third place. The Bucks would obviously benefit from having Brogdon back for a potential tough second-round matchup against the Sixers. Either way, Sunday provided a glimpse of what could be a sensational matchup in the postseason.